Nicholas Sander (Saunders), one of the twelve children of William Saunders and his wife, Elizabeth Mynes, was born in Charlwood, Surrey, in about 1530. He enrolled in Wykeham's School in 1540 and in 1548 he was made a fellow of New College, Oxford. (1) As a strong supporter of Cardinal Reginald Pole he had a difficult time during the reign of Edward VI. 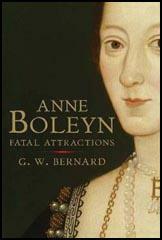 Anne Boleyn was rather tall of stature with black hair and an oval face of sallow complexion, as if troubled with jaundice. She had a projecting tooth under her upper lip, and on her right hand, six fingers. There was a large wen (tumour or wart) under her chin, and therefore to hide its ugliness, she wore a high dress covering her throat. She was handsome to look at... She was the model and the mirror of those who were at court, for she was always well dressed, and every day made some change in the fashion of her garments. On 24th January 1536 he (Henry VIII) took a heavy fall. He was unconscious for over two hours... Henry recovered, apparently none the worse apart from a few bruises, but five days later Anne was delivered of a stillborn son. She claimed that it had been the shock of Henry's accident that had brought this about, but there had been earlier signs of difficulty, and it is likely that the true cause was quite different. Shaken as he was, the king again became a prey to superstitious fears. Had he now done something else to offend a God who was proving so unsympathetic? Many years later Nicholas Sanders, who was a bitter enemy of everything that Anne represented, told a story to the effect that the foetus had been deformed, and that Henry convinced himself that he could not have been the begetter. This was plausible in the sense that it represented a view widely held at the time that deformity in a child was the consequence of unlawful procreation; but there is no contemporary evidence either of deformity or of such a reaction on Henry's part. 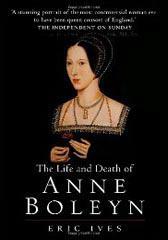 The most complete extant description of Anne's appearance that has survived from her lifetime is in a hostile report of a Venetian ambassador, who described her when she was on a visit to Calais in 1532. Sympathetic to Catherine of Aragon, he said disparagingly about the king's love: "Madame Anne is not one of the handsomest women in the world; she is of middling stature, swarthy complexion, long neck, wide mouth, bosom not much raised, and in fact has nothing but the English king's great appetite and her eyes, which are black and beautiful." Some biographers have tried to reconcile the scurrilous remarks of Sander, the first writer to portray Anne publicly as deformed... Had there been even a hint of a deformity in Anne's appearance, the Venetian, as well as the Imperial ambassadors, some of whom knew her father quite well because of his diplomatic experience, would have eagerly revealed this intriguing fact to their respective governments. Sander showed his bias by describing her as "rather tall of stature with black hair and an oval face of sallow complexion, as if troubled with jaundice. She had a projecting tooth under her upper lip, and on her right hand, six fingers. There was a large wen (tumour or wart) under her chin, and therefore to hide its ugliness, she wore a high dress covering her throat." She was handsome to look at." This bizarre description was written by a man who was only nine when she died; there is no evidence that Anne "wore a high dress", which was not fashionable at this time. Her portraits show that she did not usually cover her neck. Often the accusations of witchcraft marred people's description of her - how else could she have made good King Henry forsake his devoted wife and the Pope?